Rabbit polyclonal Cardiac Troponin I antibody. Validated in WB, ELISA, IHC, Flow Cyt, ICC/IF and tested in Mouse, Rat, Human, Pig. Cited in 54 publication(s). Independently reviewed in 14 review(s). Synthetic peptide conjugated to KLH derived from within residues 1 - 100 of Human cardiac Troponin I. 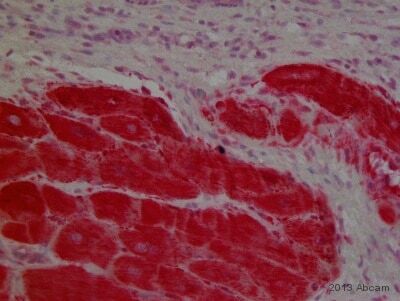 This antibody gave a positive signal in the following tissue lysates: Heart (human) tissue lysate, mouse heart tissue. Our Abpromise guarantee covers the use of ab47003 in the following tested applications. WB Use a concentration of 1 µg/ml. Detects a band of approximately 26 kDa (predicted molecular weight: 24 kDa).Can be blocked with Human Cardiac Troponin I peptide (ab47002). IHC image of Cardiac Troponin I staining in human heart formalin fixed paraffin embedded tissue section, performed on a Leica BondTM system using the standard protocol F. The section was pre-treated using heat mediated antigen retrieval with sodium citrate buffer (pH6, epitope retrieval solution 1) for 20 mins. The section was then incubated with ab47003, 1µg/ml, for 15 mins at room temperature and detected using an HRP conjugated compact polymer system. DAB was used as the chromogen. The section was then counterstained with haematoxylin and mounted with DPX. 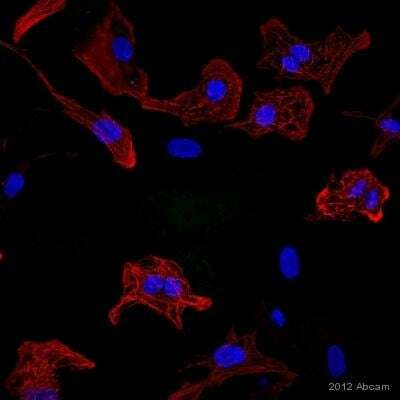 ab74003 staining Cardiac Troponin I in neonatal Rat cardiomyocytes by ICC/IF (Immunocytochemistry/immunofluorescence). Cells were fixed with paraformaldehyde, permeabilized in 0.1% Triton X-100 and blocked with 3% BSA for 1 hour at 25°C. Samples were incubated with primary antibody (1/400 in 3% BSA + PBS-T) for 12 hours at 4°C. An AlexaFluor® 594-conjugated Goat anti-rabbit IgG polyclonal (1/500) was used as the secondary antibody. Additional bands at: 160 kDa, 80 kDa. We are unsure as to the identity of these extra bands. Immunohistochemical analysis of frozen mouse heart tissue labeling Cardiac Troponin I with ab47003 at 1/100 dilution. ab47003 staining Cardiac Troponin I in Human cardiomyocytes by ICC/IF (Immunocytochemistry/immunofluorescence). Cells were fixed with paraformaldehyde, permeabilized with 0.1% Triton X-100 and blocked with 1% BSA for 30 minutes at 20°C. Samples were incubated with primary antibody (1/200 in PBS + 1% BSA) for 1 hour at 20°C. An undiluted FITC-conjugated Goat anti-rabbit IgG polyclonal was used as the secondary antibody. Publishing research using ab47003? Please let us know so that we can cite the reference in this datasheet. Please read below and see the attached images (the troponin is green, cd31is pink) and advise to interpret the results. I appreciate the time taken to submit protocol information. The details you have kindly provided will provide us with vital information for our monitoring of product quality. I would also appreciate if you could please provide the order and batch details. Cell fixation should be done under cold conditions. Using ice cold methanol, and optimizing it with other fixatives, such as 3-4% paraformaldehyde in PBS pH 7.4 for 15 min at room temperature. For antibody ab24590 permeabilization is not required as the target protein is expressed in the membrane. For ab47003 I would recommend increasing the permeabilization conditions, by using more concentrated Tween 20 or 0.25% Triton X-100. The unspecific signal obtained may be due to unspecific binding of the antibody as there has not been any blocking of unspecific binding sites. This could be improved by using 3%BSA for 30 min / 1 hour at room temperature. Also, in order to facilitate the antibody to reach the target, incubation overnight at 4C normally gives better results than 1 hour incubation. Our customer retested following your suggestion. But she said they still stained in nucleus and showed dotty not clear pattern. Thank you for getting back to me with the new results obtained. 1. Carry out a "no primary" control. This would involve staining the cells with the secondary antibody only at the same dilution as used before (1/40), then measure the fluorescence using the same parameters used for the images shared with me, i.e. using the rhodamine filters. This will allow you to see exactly how much of the non-specific staining is derived from the secondary antibody binding to the cells non-specifically. Ifnon-specific binding of the secondary antibody is observed Iwould suggest reducing the concentration of secondary antibody used to 1/200 and 1/500 to see if the results improve. 2. What buffer is being used to dilute theprimary antibody? I would suggest using 3% BSA in PBST. 3. Do you know what staining you would expect to get in human mesenchymal stem cells? Do you have any references where similar staining has been performed? Do you have access to a good positive control such as cardiomyocytes? I hope these suggestions will be of help. Our customer knows this protein is in cytoplasm ofcells buther datashowed in nucleus. So she would like to know if this protein can be detected in nucleus. Thank you for taking time to complete our questionnaire and sorry for the delay in getting back to you. I am sorry to hear that this antibody is not providing satisfactory results. The details provided will enable us to investigate this case and will provide us with vital information for monitoring product quality. We would not expect the kind of nuclear staining observed in your experiments. Having reviewed this case, I would like to offer some suggestions to help optimize the results from ab47003 and obtain the staining expected. In the blocking buffer I would also introduce 0.3 M glycine. This will bind any free aldehyde groups that could otherwise bind the primary or secondary antibody potentially leading toa high background. 2. I would also suggest reducing the concentration of the primary antibody used, from 1/100 to 1/400. 3. I would suggest checking the non-specific binding of the secondary antibody. 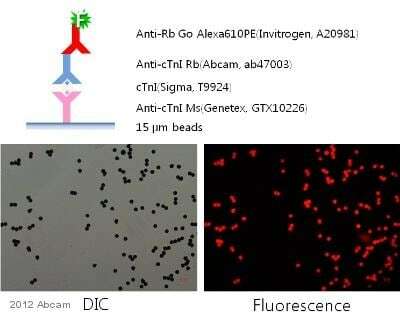 This can be performed bu incubating the slide with the secondary antibody following the normal blocking step and viewing the slide as normal using the Rhodamine filter. If this is contributing to the non-specificity I would suggest reducing the concentration from 1/50.